"Immunopharmacology" , why not "pharmacoimmunology"? Professor H. O. Schild University College London, 1962 An intact immune response is essential for survival, as is evidenced by the various innate immune deficiency syndromes and by the emergence of the acquired immune deficiency syndrome (AIDS) as a pandemic during the last decade. Substances which stimulate the immune response might contribute to the therapy of AIDS and its precursor, AIDS-related syndrome, as well as of other clinical conditions in which immune responses can be diminished, such as carcinoma and infections. In other circumstances, an intact or heightened immune response may pose clinical problems; hence there is need to suppress, or diminish, components of the immune response. For instance, it is necessary to impair cellular immunity in order to ensure lasting acceptance of heterografts and it is already established that agents effective in transplantation are therapeutically effective in an range of autoimmune diseases. More recently, experimental studies have indicated that aberrant manifestations of humoral immunity, as in allergies, may also be amenable to pharmacological intervention. Glossary of Common Immunological Terms.- 1.- 1 The Evolution, Ontogeny, and Physiologic Function of Lymphocytes.- A. What is a Lymphocyte?.- B. Phylogenetic Origin of Lymphocytes.- C. Ontogenetic Origin of Lymphocytes.- D. Generation of the B Cell Repertoire.- E. Generation of the T Cell Repertoire.- F. Genetically Controlled Nonresponsiveness.- G. Lymphocyte Function.- References.- 2 De Novo Expression of Receptors on T Cells.- A. T Cell Activation and De Novo Expression of Receptors.- B. Therapeutic Implications.- I. Immunosuppressive Therapy with M7/20 IL-2 Receptor-Specific Antibody.- II. The Effect of ART 18 IL-2 Receptor-Specific Antibody Treatment in Rat Cardiac Allografts.- III. Art 18 mAb Therapy Spares Suppressor T Cells.- References.- 3 Membrane Events During Lymphocyte Activation.- A. Introduction.- B. Phosphatidylinositol Turnover.- I. B Cells.- II. T Cells.- C. Protein Kinase C Translocation.- I. T Cells.- II. B Cells.- D. Electrophysiologic Studies.- I. K+ Channels.- II. Ca2+ Channels.- III. Na+ Channels.- E. Fluorescent Probe and Radioisotope Studies.- I. Membrane Potential.- II. Intracellular Free Ca2+ Levels.- III. Cytoplasmic Alkalinization.- IV. Regulatory Volume Responses.- References.- 4 Intracellular Events During Lymphocyte Activation.- A. Introduction.- B. Cytoskeletal Changes.- C. Lipid Changes.- I. Phosphatidylinositol Metabolism.- II. Phosphatidylcholine Metabolism.- III. Arachidonic Acid Metabolism.- IV. Summary of Lipid Changes.- D. Transport Changes.- I. Ions.- II. Nutrients.- E. Changes in Cyclic Nucleotides and Protein Phosphorylation.- I. Cyclic AMP.- II. Cyclic GMP.- III. Protein Phosphorylation.- F. Conclusions.- References.- 2.- 5Generation and Measurement of Antibodies.- A. Introduction.- I. B Cell Development Leading to Antibody Production.- II. Antibodies as Diagnostic Tools.- B. Induction of Antibody Formation.- I. In Vitro Antibody Formation.- II. In Vivo Antibody Formation.- C. Measurement of Immunoglobulin Secretion at the Cellular Level.- 1. Cell Suspensions from Lymphoid Organs of Mice.- 2. Cell Suspensions of Human Origin.- I. Antibody-Secreting Cell Assays.- D. Measurement of Circulating Immunoglobulins.- I. Precipitation-Based Assays.- II. Agglutination-Based Assays.- III. Ligand-Binding Assays.- References.- 6 Monoclonal Antibodies to Lymphocyte Surface Molecules as Probes for Lymphocyte Functions.- A. Introduction.- B. Methods for Monoclonal Antibody Generation.- I. Immunization Strategies.- II. Fusion.- III. Screening.- IV. Cloning.- C. Functional Molecules.- I. T Cell Lineage Restricted.- II. Growth Factor Receptors.- III. Receptors for Components of Complement.- IV. Leukocyte Adhesion Molecules LFA-1 and LFA-3.- D. Recognition Molecules.- I. T4 and T8: Class II and Class I Recognition Molecules.- II. Cell Receptor for Antigen.- E. Summary.- References.- 7 Interleukin 1 Production from Various Cells and Measurement of its Multiple Biologic Activities.- A. Introduction.- B. Production of IL-1 In Vitro.- I. IL-1 Induction from Peripheral Blood Monocytes.- II. Cell Sources of IL-1.- C. Production of IL-1 In Vivo.- I. Detection of IL-1 in the Circulation.- II. Detection of IL-1 in Synovial Fluid.- III. Detection of IL-1 in Urine.- IV. Detection of IL-1 in Peritoneal Fluid.- D. Assays for IL-1.- I. Lymphocyte Activation Assays.- II. Induction of Acute Phase Responses.- III. Assays for IL-1 Employing its Catabolic and Inflammatory Properties.- References.- 8 Production and Measurement of Interleukin 2 and Interleukin 3.- A. Introduction.- B. Interleukin 2 (IL-2).- I. The T Cell Growth Factor, IL-2.- II. Production.- III. Measurement.- IV. Standardization.- V. Measurement of IL-2 mRNA by Northern Blot Analysis.- VI. Measurement of IL-2 mRNA by Microdot Hybridization.- C. Interleukin 3 (IL-3).- I. The Multilineage-Specific Hematopoietic Growth Factor, IL-3.- II. Production.- III. Measurement.- D. Human IL-3-Like Factors.- E. Conclusions.- References.- 9 Production and Measurement of Interferons.- A. An Overview of the Interferon System.- I. Introduction.- II. Discovery of Interferons.- III. Heterogeneity of Interferons.- IV. Multiple Biologic Effects of Interferons.- B. Interferon Induction/Production.- I. Induction.- II. Induction/Production by Cells In Vitro.- III. Production In Vivo.- IV. Mass Production and Purification.- C. Interferon Assays.- I. Biologic Assays.- II. Nonbiologic (Immunologic) Assays.- D. Interferon in the Clinic and its Future.- References.- 10 Factors Regulating IgE Synthesis.- A. IgE Regulation.- I. Development of an IgE Response.- II. Evidence for a Specific IgE Isotype Regulation.- III. Models of IgE Regulation.- IV. Methods for Measuring IgE-Specific Immunoregulation.- B. Production and Measurement of IgE-Regulating Factors.- I. Suppressive Factor of Allergy (SFA).- II. Human IgE-Binding Factors (IgE-BF).- III. IgE Class-Specific Suppressive Factors of T Cell Origin (IgE-TsF).- IV. IgE-Binding Factors (IgE-BF).- V. Glycosylation-Enhancing and -Inhibiting Factors (GEF and GIF).- C. Future Developments.- References.- 11 Generation, Biology, and Assay of Efferent Lymphokines.- A. Introduction.- B. Migration-Inhibitory Factor (MIF).- I. Original Observations and Biologic Characteristics.- II. Cellular Source.- III. Molecular Characteristics.- IV. Measurement.- C. Macrophage-Activating Factor (MAF).- I. Original Observations and Biologic Characteristics.- II. Molecular Characteristics.- III. Several MAFs and Steps in Macrophage Activation.- IV. Measurement.- D. Tumor Necrosis Factor (TNF-? ).- I. Original Observations.- II. Biologic Characteristics.- III. Molecular Characteristics.- IV. TNF Receptors.- V. Identity of TNF-? with Cachectin.- VI. Measurement.- E. Lymphotoxin (TNF-? ).- I. Original Observations.- II. Biologic Characteristics.- III. Producer Cells.- IV. Molecular Characteristics.- V. Synergism with Other Cytokines and Effects on Lymphocytes.- VI. Anticarcinogenic Activity.- VII. Measurement.- F. Osteoclast-Activating Factor (OAF).- I. Biologic Characteristics.- II. Molecular Characteristics.- III. Measurement.- G. Soluble Immune Response Suppressor (SIRS).- I. Biologic Characteristics.- II. Molecular Characteristics.- III. Measurement.- H. Chemotactic Cytokines.- I. Biologic Characteristics.- II. The Search for Molecular Characterization.- III. Measurement.- J. Concluding Remarks.- References.- 12 Lymphocyte Purification, Growth, Cloning and Functional Assays.- A. Introduction.- I. Tissue Culture.- II. Freezing and Thawing of Cells.- B. T Cell Growth and Cloning.- I. Introduction.- II. In Vivo Generation of Antigen-Primed T Cells.- III. Feeder Cells.- IV. Antigen In Vitro.- V. Sources of Interleukin 2.- VI. Antigen-Independent Growth and Cloning.- VII. Antigen-Dependent T Cell Lines.- VIII. Cloning from Antigen-Dependent T Cell Lines.- IX. Use of Transformed Cell Lines.- X. T Cell Hybridisation.- XI. Viral Transformation.- XII. Summary.- C. B Cell Growth and Cloning.- I. Introduction.- II. Spontaneously Transformed Cells.- III. Epstein-Barr Virus Transformation of Human B Cells.- IV. Abelson Virus Transformation of Murine B Cells.- V. B Cell Hybridisation.- VI. Growth and Cloning of Transformed Cells.- VII. Purification of Normal B Cells.- VIII. Summary.- D. Concluding Remarks.- References.- 13 Screening Strategies for Detecting Immunotherapeutic Agents.- A. Introduction.- B. General Principles of Immunotherapeutic Drug Development.- I. Target Diseases.- II. Cellular Targets for Immunotherapeutic Agents.- C. Screening Methodology.- I. Quantification of Lymphocytes.- II. Functional Assays.- D. Future Developments in Screening Methodology.- I. Biochemical Assays of Lymphocyte Activation.- II. Radioreceptor Assays.- III. Monoclonal Antibodies.- E. Clinical Trials of Immunotherapeutic Agents.- References.- 3.- 14 Selected Autacoids as Modulators of Lymphocyte Function.- A. Introduction.- B. Histamine.- C. Catecholamines.- D. Prostaglandins and Leukotrienes.- E. Concluding Remarks.- References.- 15 Lipid Mediators and Lymphocyte Function.- A. Introduction.- B. Essential Fatty Acids.- I. Role in Lymphocyte Activation.- II. Actions on Lymphocytes In Vitro.- III. Actions on Lymphocytes In Vivo.- C. Prostaglandin E.- I. Cell-Mediated Immunity.- II. Humoral Immunity.- D. Other Prostaglandins and Thromboxanes.- E. Lipoxygenase Metabolites.- I. Effects In Vitro.- II. Effects In Vivo.- F. Peroxides.- G. Platelet-Activating Factor.- References.- 16 Thymic Hormones and Lymphocyte Functions.- A. Introduction.- B. Chemistry of the Four Available Thymic Peptides.- I. Thymosin ?l.- II. Thymopoietin.- III. Thymulin.- IV. Thymic Humoral Factor.- C. Effect of Thymic Hormones on Lymphocyte Markers and Functions.- I. Marker Studies.- II. Effect on T Cell Functions.- III. Mode of Action at the Cellular Level.- D. Conclusions.- References.- 4.- 17 Glucocorticosteroids.- A. Introduction.- B. History.- C. Effects of Steroids on Lymphocyte Function In Vivo.- D. Effects of Steroids on Lymphocyte Function In Vitro.- I. Humoral Immunity.- II. Cellular Immunity.- E. Effects of Steroids on Monokines and Lymphokines In Vitro.- F. Mechanisms of Action.- G. Conclusion.- References.- 18Slow Acting Antirheumatics.- A. Introduction.- B. Characteristics of Therapy.- C. The Immunologic Basis of Rheumatoid Arthritis.- D. Disease-Modifying Antirheumatic Drugs.- E. Summary.- References.- 19 Cyclophosphamide.- A. Introduction.- B. Effects of Cyclophosphamide on Cells of the Immune System.- C. Immunomodulation by Cyclophosphamide.- I. Immunosuppression and Immunostimulation In Vivo.- II. Tolerance Induction and Termination.- III. In Vitro Activities.- D. Effects of Cyclophosphamide on Autoimmune Animal Models….- I. Adjuvant Arthritis Disease of Lewis Rats.- II. Murine Models for Systemic Lupus Erythematosus.- E. Clinical Aspects of Cyclophosphamide Therapy.- F. Summary.- References.- 20 Lobenzarit (CCA).- A. Introduction.- B. Chemistry.- C. Toxicology.- D. Pharmacokinetics.- E. Immunopharmacologic Studies.- I. Prevention of Autoimmune Disease and Immunomodulation in MRL-Mp-lpr/lpr (MRL/1) Mice.- II. Prevention of Autoimmune Disease and Immunomodulation in NZB/NZW F1 Hybrid Mice.- III. Therapeutic Effect on Adjuvant Arthritis in Rats.- IV. No Inhibitory Effect on Acute Inflammation.- V. Immunoregulatory Effects.- VI. Effects on Immunocompetent Cells.- F. Clinical Studies.- I. Multicenter Double-Blind Controlled Study.- II. Long-Term Study.- 21 Cyclosporins: Immunopharmacologic Properties of Natural Cyclosporins.- A. Introduction.- B. In Vitro Methods.- I. Proliferative Response of Lymphocytes to Mitogenic Stimulation.- II. Generation of Soluble Factors Affecting the Immune Response.- III. Proliferative Response of Lymphocytes to Allogeneic Stimulation: Murine Mixed Lymphocyte Reaction.- IV. Induction of Cytotoxic T Cells in a One-Way Mixed Lymphocyte Reaction.- V. Primary Humoral Immune Response to Sheep Red Blood Cells.- VI. Secondary Humoral Immune Response Against a T Cell-Specific Antigen (DNP-KLH) In Vitro.- VII. Cytotoxic and Cytostatic Activity In Vitro with the P-815 Mastocytoma Cell Line.- C. In Vivo Methods.- I. Formation of Plaque-Forming Cells (Humoral Immune Response).- II. Delayed-Type Hypersensitivity Reaction in Mice.- III. Localized Graft-Versus-Host Reaction.- D. Autoimmune Disease Models.- I. Freund’s Adjuvant-Induced Arthritis.- II. Formation of Autoantibodies in Experimental Allergic Myasthenia Gravis.- E. Transplantation Models.- I. Skin Allograft Reaction in Mice.- II. Kidney Allograft Reaction in Rats.- III. Heterotopic Heart Transplantation in Rats.- F. Discussion.- References.- 22 Muramyl Dipeptides.- A. Introduction.- B. In Vivo Quantitative and Qualitative Changes in Specific Immune Responses Produced by MPDs.- I. Characteristics of Antibody Responses After MDP Treatment.- II. T Cell-Mediated Responses.- III. Immunosuppression.- C. In Vivo Changes in Cell Compartments of the Immune System Following MDP Administration.- D. Role of Lymphocyte Populations in Antibody Responses of Cell Cultures Stimulated with MDPs.- E. In Vitro Direct Responses of Lymphocytes to MDP in the Absence of Antigenic Stimulation.- I. Mitogenic Effect of MDPs.- II. Polyclonal Activation.- III. Influence of MDPs on Mitogenic Responses.- IV. Effect of MDP on Thymoma Cell Lines.- V. In Vitro NK Cell Induction.- F. In Vitro Indirect Responses of Lymphocytes to MDPs.- G. Conclusions.- References.- 23 Antipurines and Purine Metabolism.- A. General Introduction.- B. Antipurines: 6-Mercaptopurine and Azathioprine.- I. Historical Perspective/Background.- II. Metabolism.- III. 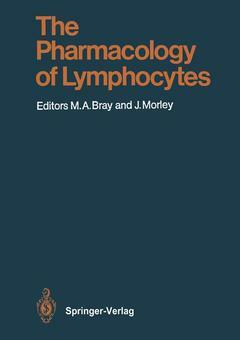 Effects on Lymphocyte Subsets.- C. Adenosine Deaminase and Purine Nucleoside Phosphorylase Deficiencies.- D. Conclusions.- References.- 24 Isoprinosine and NPT 15392: Hypoxanthine-Containing Immunomodulators.- A. Isoprinosine.- I. Chemistry.- II. Pharmacokinetics and Bioavailability.- III. Pharmacology.- IV. Toxicology.- V. Pharmacodynamics.- VI. Clinical Efficacy and Safety.- B. NPT 15392.- I. Toxicology.- II. Immunopharmacology.- III. Clinical Experience.- References.- 25Bacterial and Fungal Products.- A. Bacterial Products as Mitogens and Immunomodulators.- I. Bacterial Peptidoglycans.- II. Endotoxic Lipopolysaccharide and Lipid A.- III. Outer Membrane Protein.- IV. Lipoteichoic Acids and Related Amphiphiles.- V. Others.- VI. Speculation.- B. Fungal Polysaccharides as Immunopotentiators Against Cancer.- I. Lentinan.- II. Krestin and Schizophyllan.- References.- 26 Nonsteroidal Anti-inflammatory Drugs: Effects on Lymphocyte Function.- A. Introduction.- B. Principal Effects of Nonsteroidal Anti-inflammatory Drugs.- C. Effects of Nonsteroidal Anti-inflammatory Drugs on Lymphocytes.- I. Clinical Observations.- II. T Cell Effects.- III. B Cell Effects.- D. Conclusion and Outlook.- References.- 27 Future Prospects for Drugs Design of Lymphocyte Modulators.- A. Introduction.- B. Potential Targets for Lymphocyte Modulators.- C. Lymphocyte Modulators.- I. Transplantation and Autoimmunity.- II. Chronic Inflammatory Processes.- III. Acute Hypersensitivity Reactions.- IV. Infections and Cancer.- D. Conclusions.- References.